My family took a vacation every year while I was growing up and we always drove. 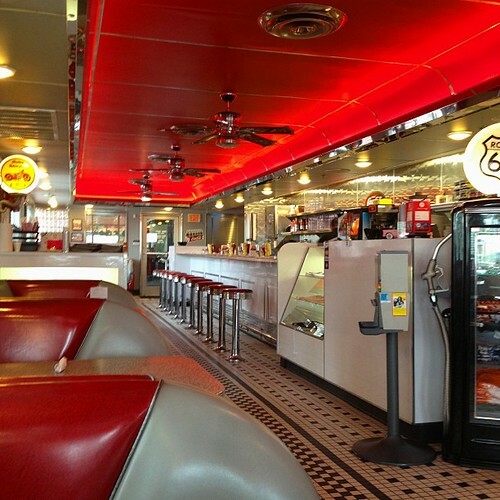 I’ve never been much of a fan of the usual breakfast foods so if we stopped for breakfast at a diner or someplace like Denny’s, I usually ordered a cheeseburger and chocolate milkshake. Apparently my mother had done the same as a child so she didn’t think this was weird at all. David had to take a short business trip to Joplin and took me with him. We went up on Sunday, he met with and trained employees today and we headed home late afternoon today. We decided to stop for an early dinner in Tulsa and I happened to spot a 50s-style diner. I normally would have ordered a turkey or club sandwich but something about the place made me want a cheeseburger and chocolate shake. I’m borderline lactose intolerant so I got water to drink but talked David into ordering a shake (which wasn’t difficult) so I could just have a little of his. I was pretty happy when it was served along with the metal milkshake container shown in the picture at the top of this post. The burgers were exceptionally good and as I enjoyed part of that milkshake I recalled those vacation breakfasts of my childhood. And then I had another related food memory. In junior high our cafeteria food was nothing spectacular but we did have a snack bar which sold a variety of items including the best chocolate shakes and pretty decent fries. 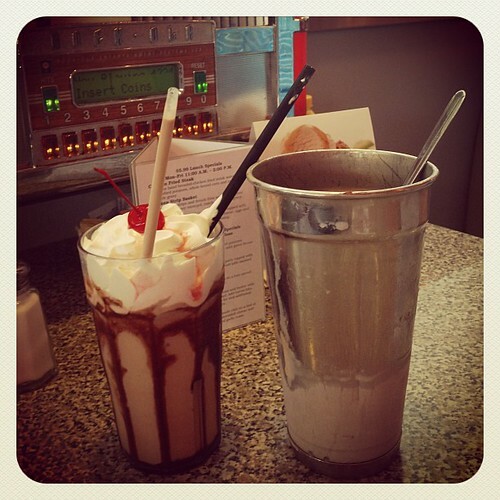 My best friend and I would split a chocolate shake and fries, dipping the fries in our shake. I hadn’t done that in years but I tried a couple this evening. Not bad. Not bad at all.